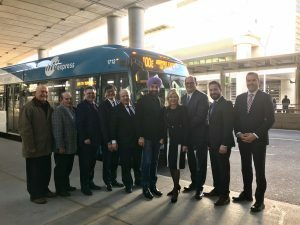 Mayor Bonnie Crombie, Members of Council and others were joined to celebrate the new Route 100 – Airport Express, which started service on October 29. The new route is now operating every 16 minutes, Monday to Friday, along the city’s dedicated bus-only Mississauga Transitway. MiWay riders can travel between 4 a.m. and 7 p.m. from Winston Churchill Station to Renforth Station and express to Toronto Pearson International Airport Terminals 1 and 3. Route 100 is just one part of the MiWay Five Transit Service Plan from 2016-2020 that is efficient, affordable and good for business in Mississauga.